Porsche? Nutcrackers? Harmonicas? Bach? I had no idea that Saxony, a free state in Germany, had so much going on! It wasn’t until my chat with Shireesh Sharma at the USTOA conference this past December that I realized the variety of types of art flourishing in a relatively small part of the world. Saxony is a term often synonymous with Dresden, and after seeing this capital city, it makes total sense. Dresden, the home of a long line of royalty, hugs the Elbe River and boasts a majestic baroque skyline. However, Leipzig, the quieter sister of Dresden, captured me even more. Located on medieval trade routes in the time of the Roman Empire, Leipzig was a powerful city with renowned cultural importance back in the day. The home of Johann Sebastian Bach, Felix Mendelssohn, Martin Luther, Johann Wolfgang von Goethe (and the list goes on), Leipzig is more than familiar with the arts. This city was built upon it. Bach composed in St. Thomas Church in the city center, Goethe’s Faust 1 was inspired by the city’s historic wine bar Auerbachs Keller, and Mendelssohn performed at the Leipzig Gewandhaus Concert Hall. And today, this city still pulsates with artistic energy. My independent tour with Avanti Destinations brought us to this city to experience the younger side of Saxony…and I’m sure glad that they did. Just walking the streets, I could feel and hear the buzz. 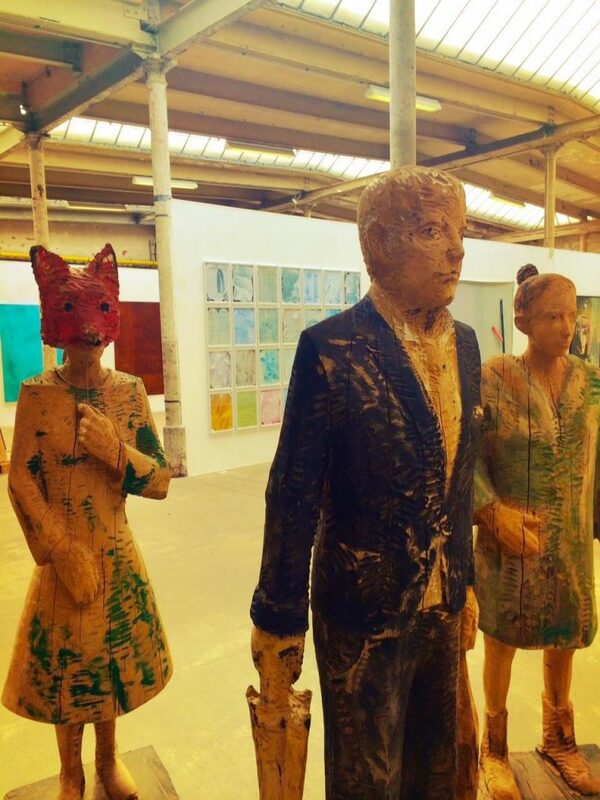 Galleries, art schools, street performers…the past, present and future of art all blended together. The factory compound spans several blocks complete with brick warehouses that previously housed spinning rooms, production halls, worker housing, and even a fire brigade. Now, these same buildings sport cracked windows, graffiti walls and ivy covered entrances. Eerily quiet on a Friday morning, from the outside, Spinnerei could be confused with a forgotten factory but inside, the darkened hallways told a very different story. “Most of the artists are sleeping,” Michael from the Information Office chuckled, as he led us inside one of the buildings. After the Wall fell, Leipzig lost some of its former glory as an industry hub and places like the Spinnerei shut their doors. However, in 1994, the Spinnerei was reinvented. 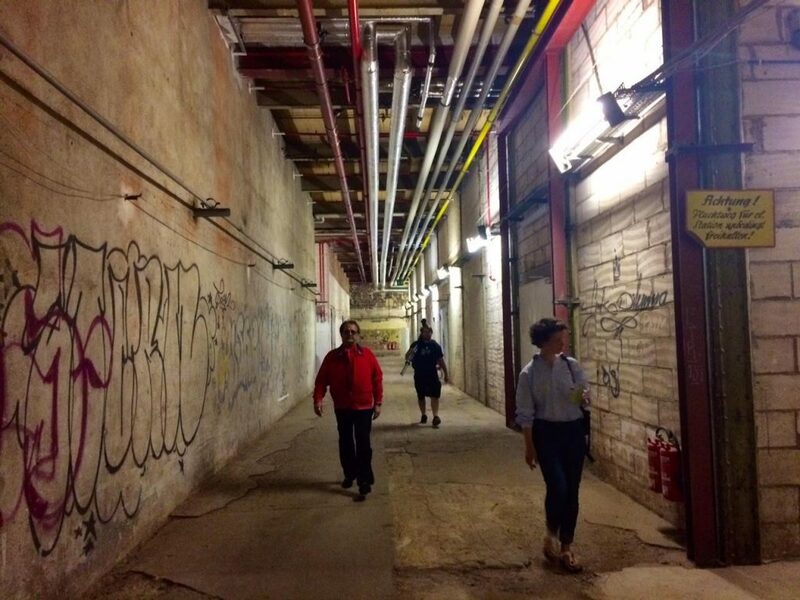 Local artists saw these massive, unoccupied spaces as the perfect location to set up shop, literally. With 11 galleries, artists are getting exposure and many are selling their works to the curious public. 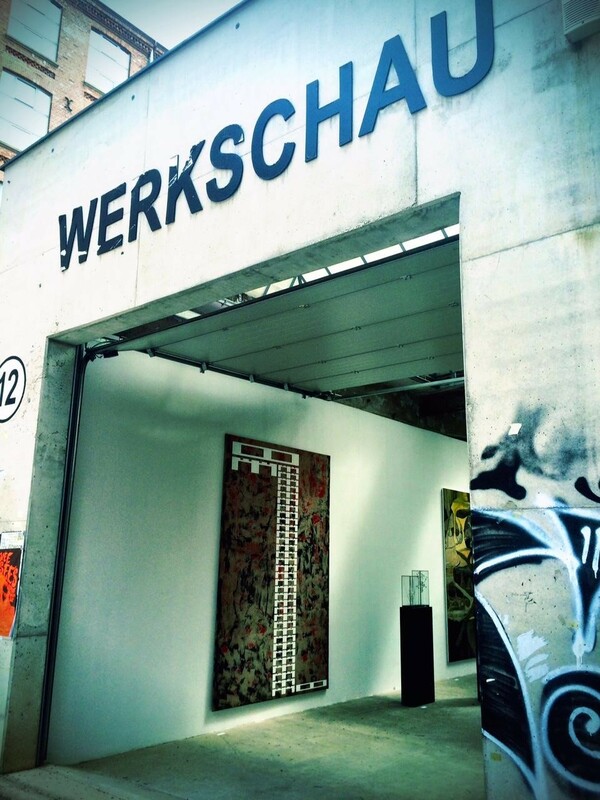 One gallery in particular, Werkshau, displayed just one piece of work contributed by every artist at the Spinnerei. 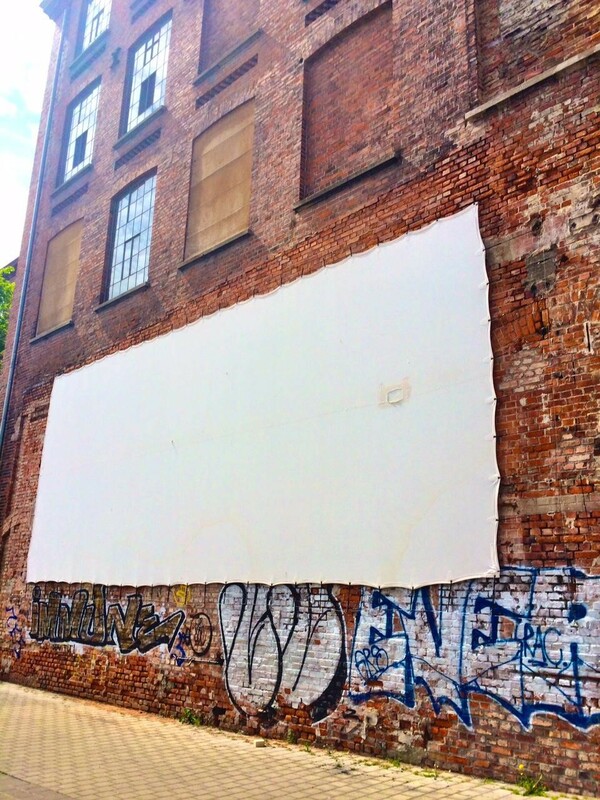 One corner had a 20×20 foot oil painting, around the other bend was an alleyway with a projector screening a video montage that reminded me of The Ring (art is subjective right?). In the middle of the space, I found myself moved by three human figures with fox faces, carved out of wood. Still there were more portraits, photography and installations, some of which incorporated movement, sound and light. And all these were produced by current Spinnerei artists, who were likely creating somewhere in the Spinnerei at that very moment. Michael took us up to LIA, an artist in residency program where young artists from all over the globe come to collaborate, learn and make art, all while living in their own studio. They sleep, create and exhibit all in the same place. 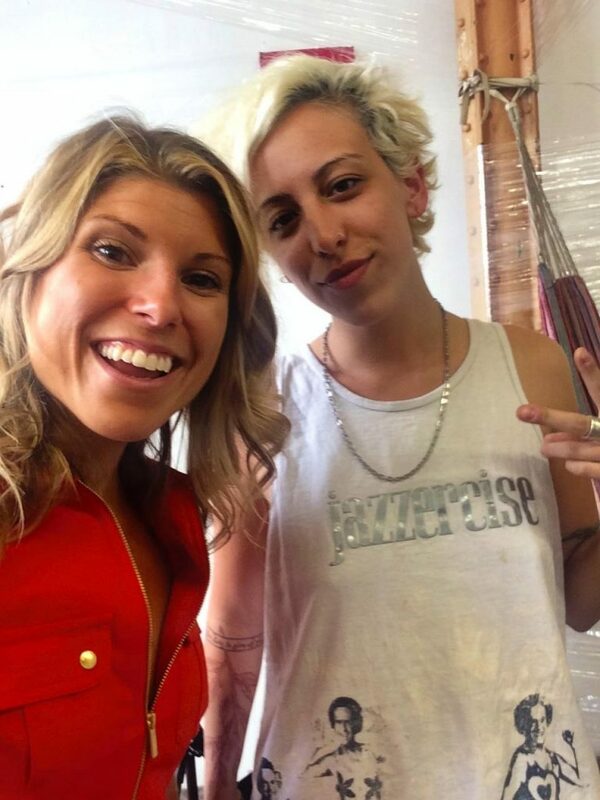 Luckily, our interviewee was awake when we knocked on her studio/home. Kylie Lefkowitz is a multi-media artist from New Jersey and she’d been living in this large one room studio for the past 4 months. Her bed was tucked off in the corner featuring a James Franco calendar, piles of clothes and scattered art supplies on the floor, not unlike a typical college dorm room. The rest of the space was her exhibit…she was truly living her art. I liked how Kylie focused on words: messages, thoughts, musings and phrases that she expressed via all types of media. Each piece definitely made me think and feel. We interviewed her as she swung on her hammock, telling us about living in Leipzig, being a part of LIA and calling this studio home – all with unbridled exuberance. We could have talked with her all day. 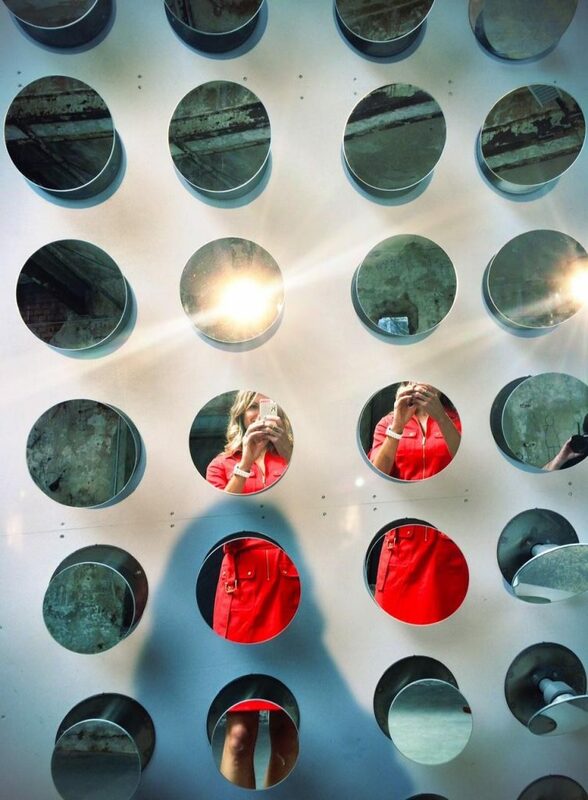 Her candid stories were fascinating and it was through her that we realized just how impactful the Spinnerei really was and how it played a big role in Leipzig. Some artists here use it as a workshop, a great studio space, she told us. The galleries draw large crowds, some of which are buyers. 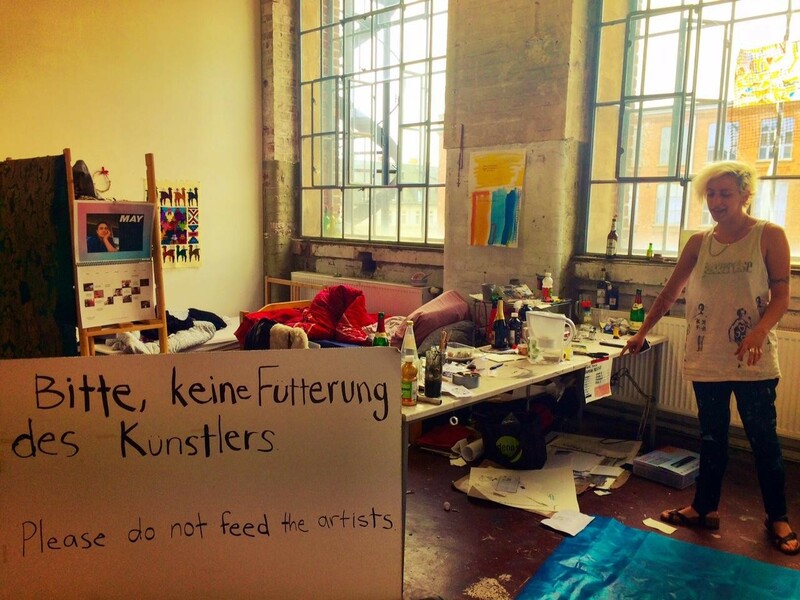 Other artists use the Spinnerei as a place to collaborate and be inspired. With so many artistic minds in one spot, it’s only natural for partnerships and co-working to take shape. Walking out of her studio, down a hall that looked like it could be in a horror movie, I realized that so much of the charm of the Spinnerei was how it hasn’t been changed or commercialized. The rusty freight elevators creakily opened out onto dimly lit*, empty hallways. But behind the doors, around the corners, down the passageways were bright studios, natural light flooding in and art flooding out. The Spinnerei hasn’t tried to cover or clean up it’s past. It embraces what it used to be; it preserves it and celebrates it. It allows art to spring up like weeds around the broken buildings, infusing them with new life. 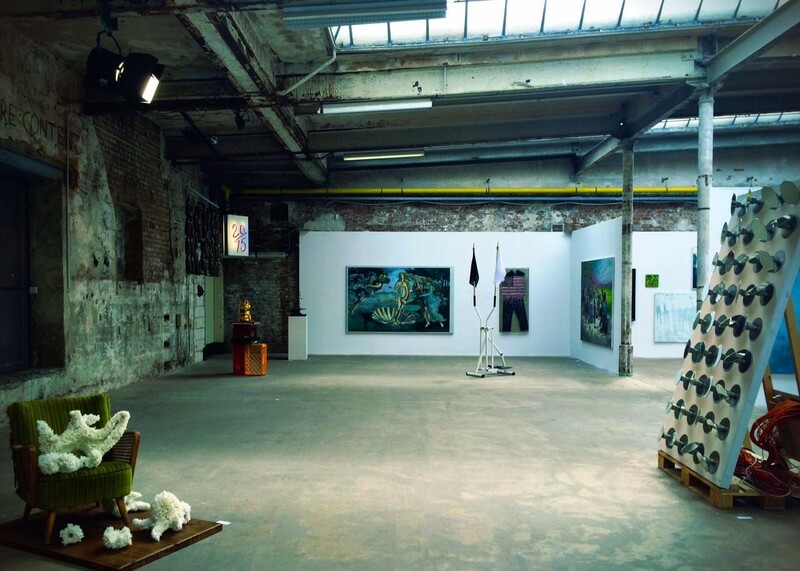 Yesterday’s artistic greats of Leipzig still hold the torch of some of the most monumental developments in the art and music world, but what is keeping Leipzig fresh, thought provoking and current, is what is happening at the Spinnerei. This is a microcosm of what has happened in Saxony. It is a rebirth, a new beginning. Leipzig might be most famous for its artists of the past but it is the artists of today that are taking Leipzig’s art scene into the future. Author’s Note: I later learned the “dimness” was because the Spinnerei is a GREEN facility. 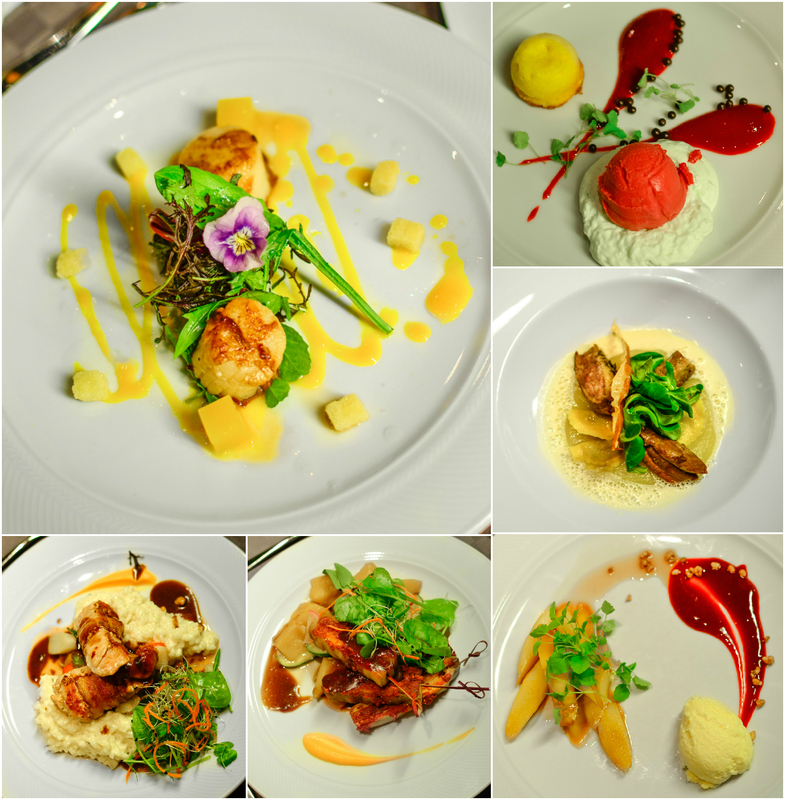 On my recent trip to Saxony, with Saxony Tourism and Avanti Destinations I was able to taste carefully prepared traditional German dishes with a Saxon twist. But beyond the great food, I loved the way many of the restaurants depict the region’s past and hold interesting stories, if you are willing to listen. 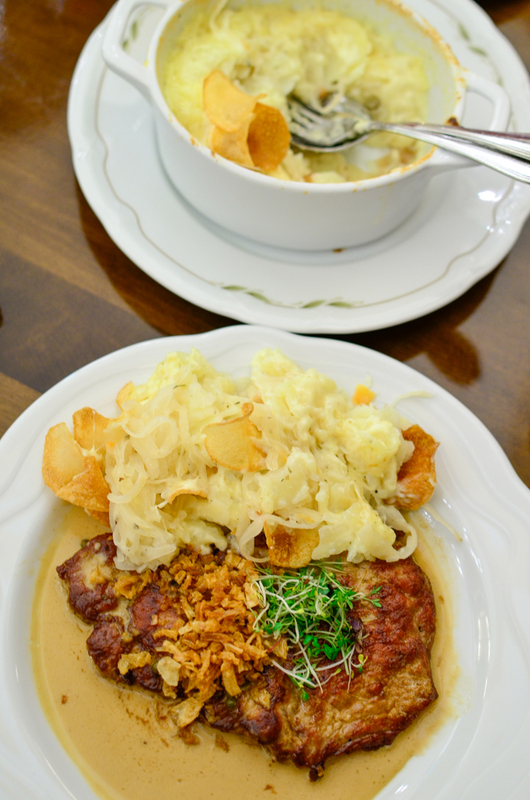 My first experience with Saxon food was the 1900 restaurant in Dresden. Decorated in 1930s memorabilia (to include a real size tramcar inside the restaurant) it offers delicious, and very sizable pork dishes and Saxon dumplings. Here I had the opportunity to sample quarkkäulchen, a type of potato and quark dumpling served with grated apples and cinnamon, an interesting and very delicious dessert. Another must-try in Dresden is the restaurant Pulverturm. The former gunpowder tower has been restored and decorated in a way that takes you back to medieval times. With an open kitchen, you can see the suckling pig, roasting on a spit, as soon as you enter. Another sumptuous desert I sampled was eierschecke, a confectionary specialty of Saxony. One thing to not miss out on is the famous funnel drinking, called “Dresdner Trichtertrinken”. It’s a green liqueur called “Cosel tear” which people drink after the meal. Cosel was the mistress of Augustus the Strong, King of Poland and Elector of Saxony. The drink is supposed to represent her tears upon Augustus’ death. No trip to Dresden is complete without a visit to Schiller Garten, dating from the end of the 17th century, and situated at the foot of the King Albert Bridge, on the shores of the Elbe River. 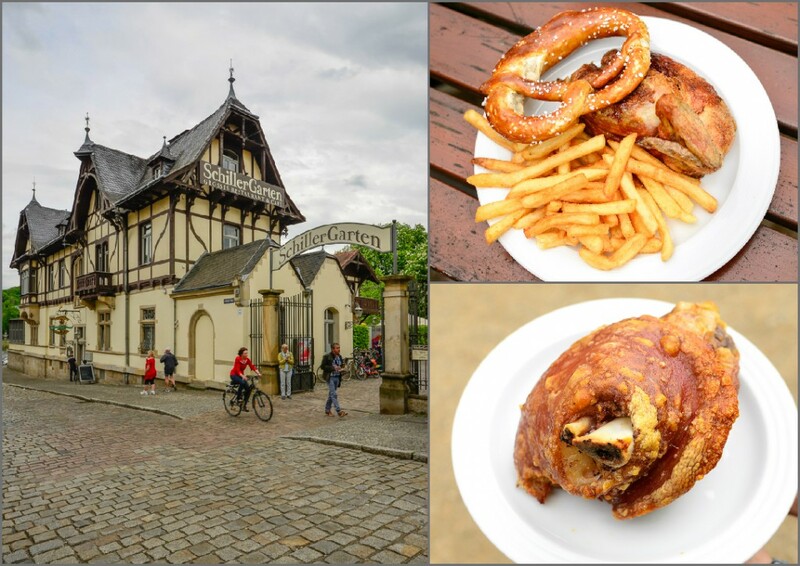 For a few euros you can choose half a chicken with fries and a freshly baked pretzel, or a pork knuckle as big as your head, and wash it down with refreshing beer. Unfiltered and unpasteurized, it feels like each sip is a meal on the tongue. It is probably the most local thing you can do in Dresden. 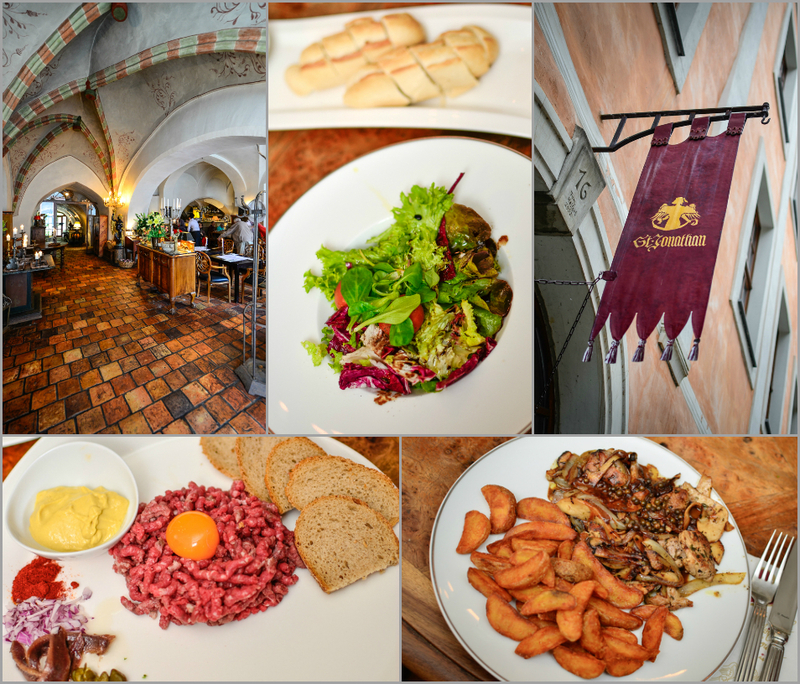 While visiting Görlitz a great place to eat is St. Jonathan. The interior is cozy and romantic, with high ceilings and gothic arches. The managing director of the restaurant had a very small part, as the Chef, in the Oscar nominated movie “The Grand Budapest Hotel”, filmed on the streets of Görlitz. It was interesting to hear him speak about his experience although he and the rest of the town are used to big movies being filmed in Görlitz. Here I tried, for the first time, red beet soup and delicious steak tartar. Who knew I would ever enjoy raw beef? 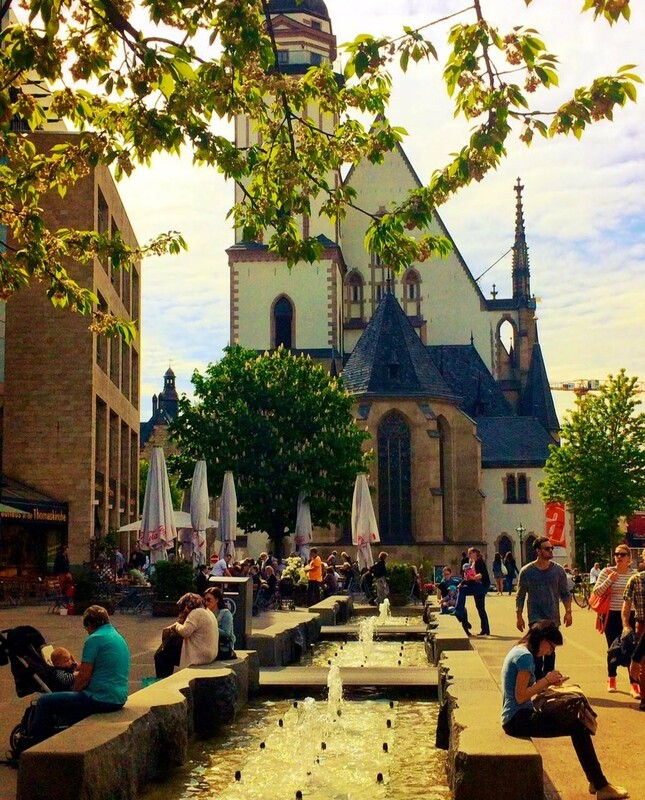 I loved Leipzig for the relaxed atmosphere and diverse food scene. Panorama restaurant at the top of Panorama Tower was a special treat. It’s a fine dining restaurant that takes Saxon food to a new level of sophistication in a romantic setting, on top of the city. 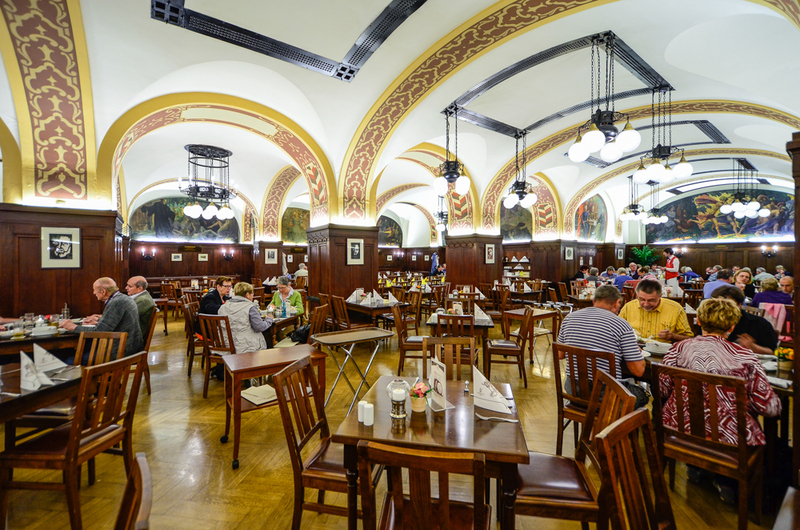 A very interesting (and the second oldest restaurant) in Leipzig, is Auerbachs Keller, dating to at least the first half of the 15th century. We had lunch in the Goethe Keller, probably the most famous guestroom in Germany, decorated with semicircular paintings depicting images from Faust. Painted by Andreas Bretschneide in 1625, they are among the most important urban and cultural history exhibits in Leipzig. Beside Goethe, Johann Sebastian Bach and Richard Wagner dined here. 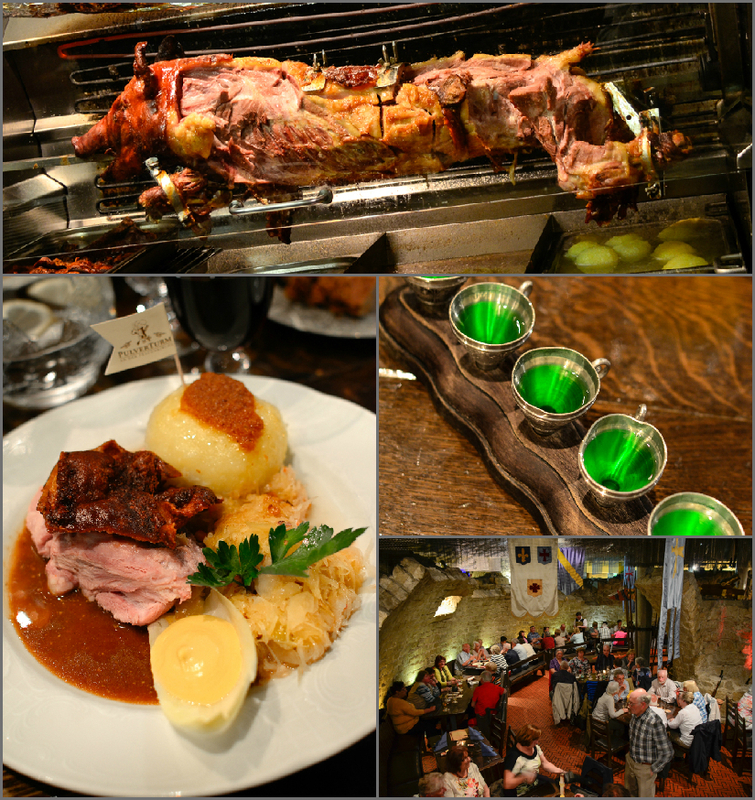 Be prepared to have huge meals of traditional Saxon food. 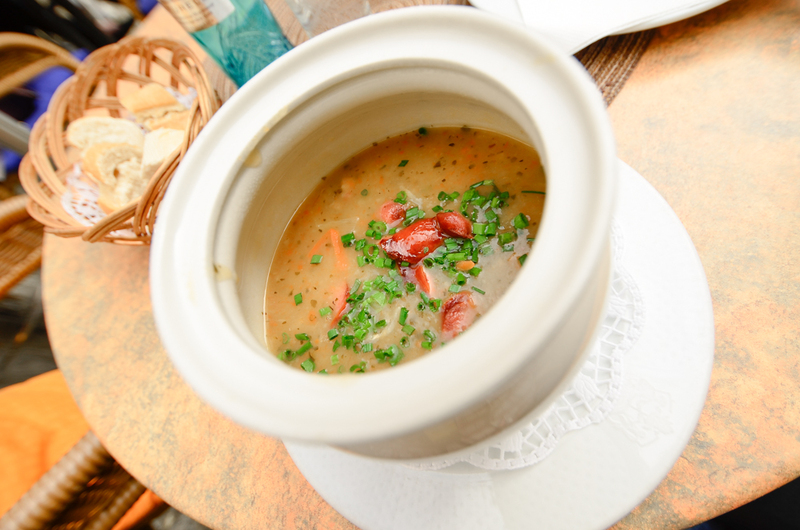 As a final Saxon treat try the potato soup with sausages served at many cafes in the center of Leipzig. Reflecting on my trip, having made my taste buds happy with the many Saxon dishes, I will have to come back with family in tow. 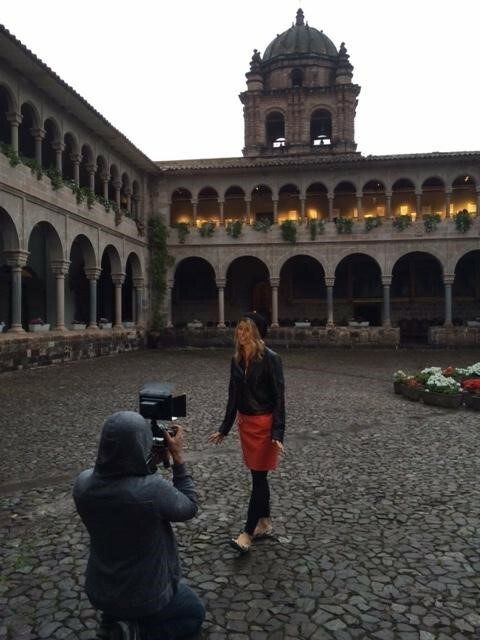 Germany-based AFAR Magazine Ambassador Adriana Yampey, who has also lived in Romania, France, Italy, Belgium and the United States, dreams of seeing the world and documenting it through photos. Follow her travelers on Adriana’s Facebook and Twitter accounts. You can hear more about her journey to Saxony at AFAR.com. 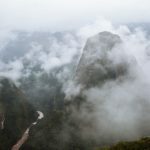 Peru is a beautiful country where the topography varies drastically. When I flew into mountainous Cusco from coastal Lima the beauty (but mainly the altitude) took my breath away! 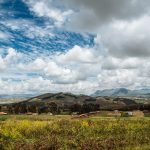 My tour group was to visit some of the popular towns and archeological sites in and around what is called the Sacred Valley, which runs from Machu Picchu to Urcos along the Urubamba River in the south-central region of Peru. This valley encompasses a large area so trying to pick a feasible number of destinations within the valley can be daunting. Luckily my tour group was led by USTOA tour operator member Travcoa and partner PromPeru who provided an incredible itinerary which included visits to the following: the ancient city of Cusco, the colonial settlement of Chinchero, the agricultural sites of Maras and Moray, the small yet busy Machu Picchu Pueblo, and of course Machu Picchu itself. 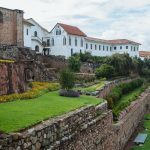 Perhaps the best place to start exploring the area around the Sacred Valley is from the once capital city of the Incas, Cusco. 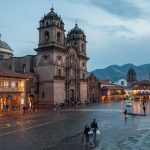 Cusco is a beautiful city wherein the locals have a strong link to their Inca ancestors as most structures are literally built on top of old Inca foundations. Central Cusco seems like a complex maze of streets and alleys but it is surprisingly easy to navigate on foot. The Plaza de Armas which is both scenic and centrally located makes for a great place to start exploring Cusco. One structure that shouldn’t be missed is the La Catedral (and attached Church of Jesus Maria). The ornate cathedral that was built in the 1500s’ is a great example of the Spanish religious influence in the region. Another thing you’ll notice that has Spanish influence is the Portal de Panes – a covered area of sidewalk surrounding the plaza, where there are numerous handicraft shops and relaxing cafes that offer views overlooking the plaza. It makes for an ideal place to sit and have a drink or to simply do some people watching. 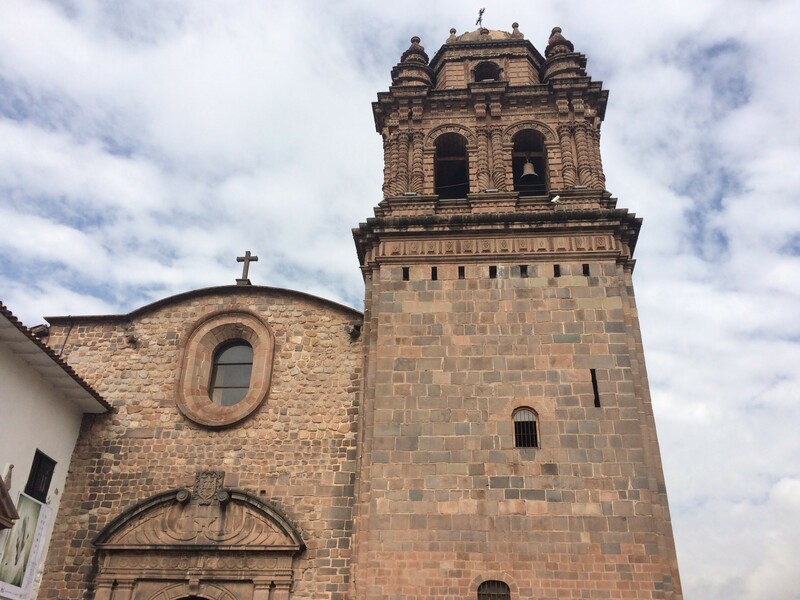 From the Plaza de Armas, our group headed southeast towards a major Cusco attraction – the Q’orikancha complex, a large and breath-taking temple of worship, of great importance to the Inca. 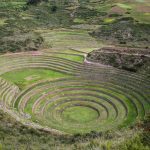 The ingenuity of the Inca is apparent at Q’orikancha as its’ geographic location within the Cusco Valley aligns with hundreds of sacred monuments, significant stones, natural springs and prehistoric quarries. What’s even more impressive is that during the summer solstice the suns’ rays only shine into a specific area of the temple where only the emperor was allowed to sit. Driving through the Sacred Valley was incredible; the Andes provide a very dramatic backdrop and the random livestock make you feel miles from civilization. 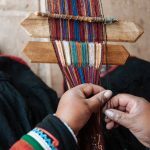 We made stops at the Moray agricultural and ceremonial tiered-ruins and at the breathtaking, centuries-old Salinas salt pans, but for me the most moving local experience was our stop at the Chinchero Weaving Cooperative. As we entered the collective I felt bombarded by color. There were around 25 women of varying ages, most working on some type of loom. The woman who greeted us also gave us a very engaging presentation that explained how these women create such stunning, intricate pieces. We learned how the alpaca and llama wool are turned into yarn, how the yarns are dyed, and how some of the looms operate. It was a thought-provoking presentation and the women working at the cooperative were so welcoming and kind. 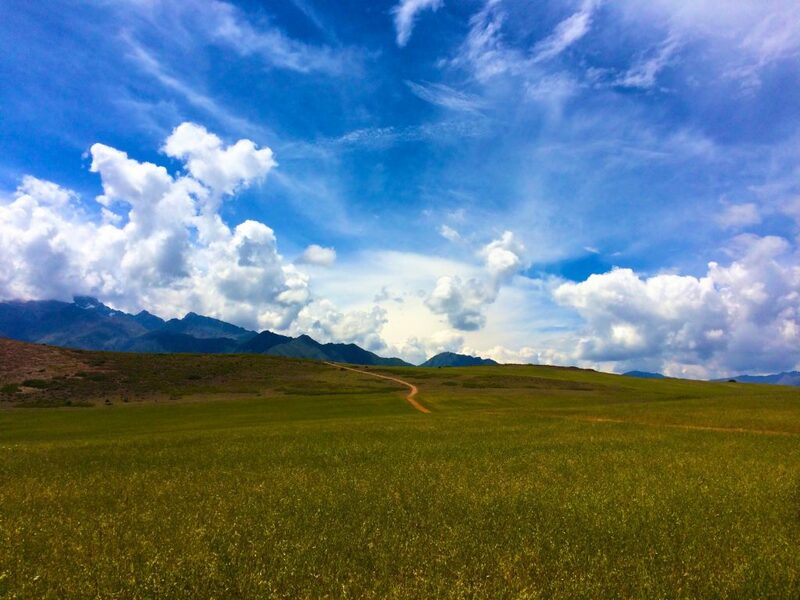 I later learned that Chinchero means “Village of the Rainbow,” a perfect name and quite befitting of my experience. Our next stop was the town of Aguas Calientes, or what is now called Machu Picchu Pueblo. 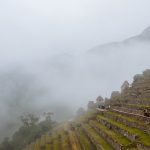 As I stepped off of the train in Aquas Calientes, I was immediately surprised by the change in climate; the chilly breezes vanished and made way for a mask of humid air and a continuous sequence of fog and cloud seemed to roll through the small town perched above the Rio Aquas Calientes. The town itself is rather small and can be explored on foot in a couple of hours. Judging by a conversation we had with locals, most people only spend one night in the town. It is a beautiful quaint town but when you’re standing in the shadow of a giant (Machu Picchu) it’s tough to truly shine as an attraction. 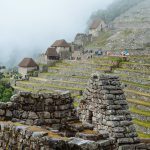 Additionally, Machu Picchu Pueblo is a challenging place to get to but I think this only adds to the allure of Machu Picchu, making the feeling of seeing the monument all the more special. On the day we were to visit Machu Picchu, the group awoke early and joined the queue for the buses that drive up to Machu Picchu around 5 am. With a bus full of almost palpable anxiety, we ascended for the next twenty minutes traversing one switch-back after another into a thick blanket of clouds. We arrived at the entrance and made our way over to what is known as the Viewing Platform. 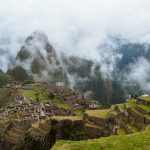 Despite some light rain and overcast skies, the ruins of Machu Picchu looked glorious. Our guides from PromPeru gave us a very informative tour and I learned a lot about the former residents of the Citadel. However, after hearing about Hiram Bingham and the 11-year-old boy who led him around the area that first time I had a hard time replacing that image in my head. We spent a few hours walking around, giving us time to see all angles of the complex. It is such an incredible place that moves everyone in a different way; a rare gem of magnificent ingenuity that truly is a wonder. Colin Roohan is a travel photographer interested in documenting experiences with culture and life. In addition to his work with AFAR, Colin has been published in Travel + Leisure, The Royal Geographical Society’s Hidden Journeys, and Groove Magazine, amongst others. In addition to journalistic pursuits, Colin captures portraits and documents events around Southern California. Hear more about his journey to Peru at AFAR.com. I remember those history classes back in high school where we memorized dominant civilizations that shaped the world as we know it. Even in textbooks, the Incan Empire was particularly impressive with their communal practices, integration of other people and their (mostly) peaceful expansions across Western South America. But it’s hard to really grasp the magnitude of an empire that spanned across multiple countries and was made up of millions of people, especially when all of it happened hundreds of years ago. On paper these things can feel inaccessible. 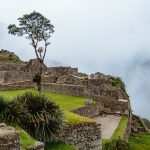 But one way to understand history is by going to the source, and one visit to Peru is all it took for me to fully realize the history of the Incas and Peru’s heritage. You just want to frolic through these fields, trust me. 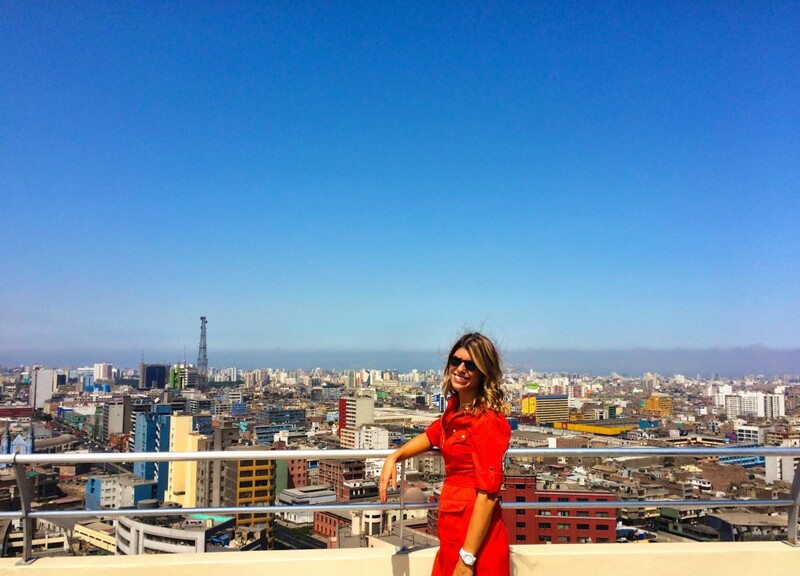 I arrived in balmy Lima on an April evening on tour with Travcoa, and was surprised by how much larger and more vibrant the city was, compared to what I had expected. Shoppers strutted along the streets lined with contemporary boutiques, children played in parks, friends sipped Pisco at cozy cafes and surfers tackled the Pacific break along the city’s expansive coastline. I wanted to live here! This city was very much alive and much more modern than my Incan history lessons had led me to believe. 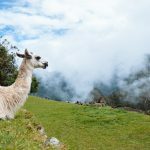 Though Lima balanced its youthful exuberance with iconic cathedrals, museums and tributes to its world famous past, it wasn’t until touchdown in Cusco that I really understood Peru’s backstory. Cusco was the capital of the Inca Empire. The Temple of the Sun was where the Inca King addressed his people, adorned in all gold so his constituents could see his gleaming reflection from miles away. The temple was seized by the Spaniards, converted to a Spanish cathedral, and all traces of its Incan heritage were covered up. So much power, importance and strife were held inside these walls…walls that happened to be five feet from the doorstep of my hotel, the Palacio del Inka (which used to be an Incan Temple and later a Spanish Palace, naturally). Here in Peru, history is not only something to be remembered, it’s also something you can still participate in today. You can touch the walls, and sleep in a former temple. Suddenly, the ancient past didn’t feel so ancient anymore. Outside of the charming city of Cusco, we explored the small towns scattered across the daunting Andes. Towns inhabited by local indigenous people, such as the Quechua, many whose families have lived there for generations and are descendants of the Inca. 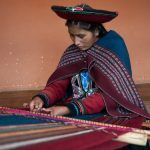 We stopped at a women’s weaving cooperative, the Center for Traditional Textiles, where I was able to talk to the Quechua women and interview their coordinator. 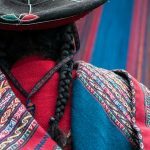 I learned that in the past, the Quechua culture revolved around agriculture and the Quechua women did more of the handicrafts and managed home life for the family, while men labored in farming, a typical scenario of many worldwide cultures. 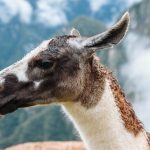 Now, however, since the Western world is changing things in rural Peru, the Quechua are losing some of their traditional culture for more modern alternatives. 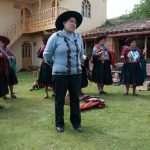 The goal of this women’s weaving cooperative is to have elder women teach younger women the highly skilled art of weaving, something that has been a part of this culture and this land since Inca times. A bonus was travelers like me got to stop by, watch them work, learn about their craft and take home a scarf or sweater, with proceeds going back to the women. 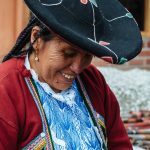 This seemed to be a beautiful balance of providing financial empowerment for Quechua women, educating travelers about traditional customs and preserving the ancient culture. 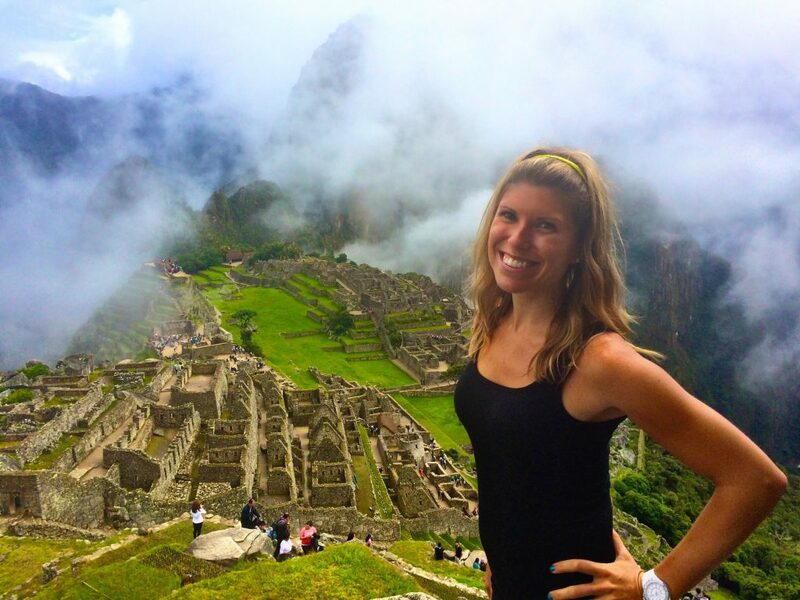 Staring at Machu Picchu, I had to close my eyes as a gust of smoke was blown over my face. As the Shaman recited something in a monotonous rhythmic tone, I felt a splash of some sort of herbal potion on my face. 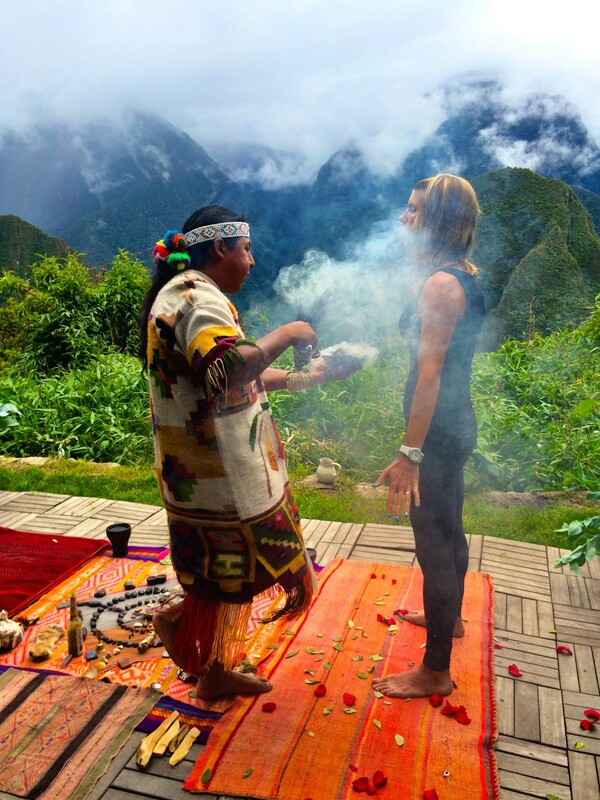 I was participating in a cleansing ritual, something the native Quechua Indians have performed for centuries. 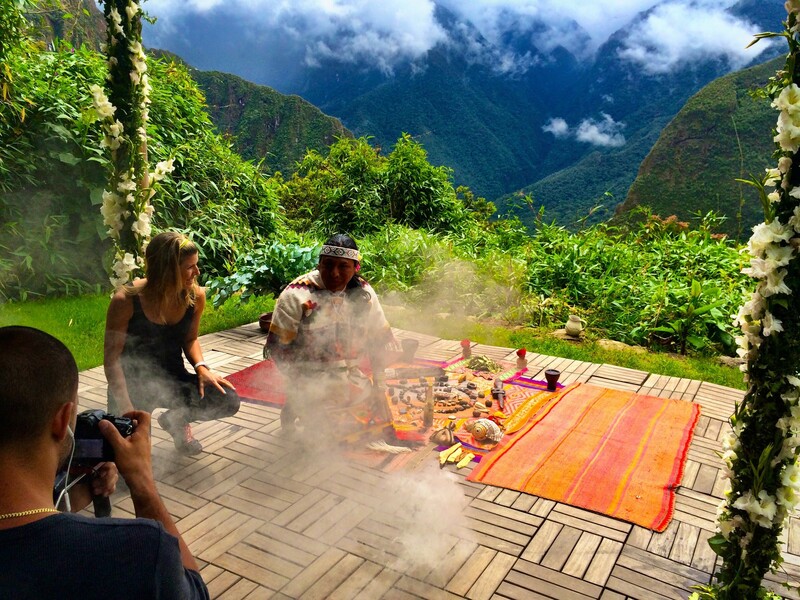 Willko Apaza, the resident shaman from a nearby village, came to meet with me and perform this ceremony at the Sanctuary Belmond Lodge, the only hotel located on Machu Picchu. 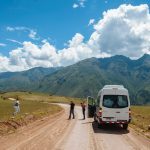 It was quite a picturesque spot, a landing area with a background view of the Andean peaks. 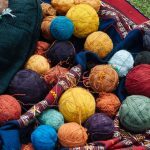 A blanket had been laid out with the various natural instruments that Willko used to invoke the spirits of Quechua beliefs. And I silently stood – arms and legs out in shape of a star – as Willko talked to the spirits and used ancient practices to help improve soul. Sure, this is a service that you pay for, much like a spa experience, but Willko was a real local, practicing revered Shaman and he performed the ritual with as much seriousness and dedication as his ancestors had done many times before. 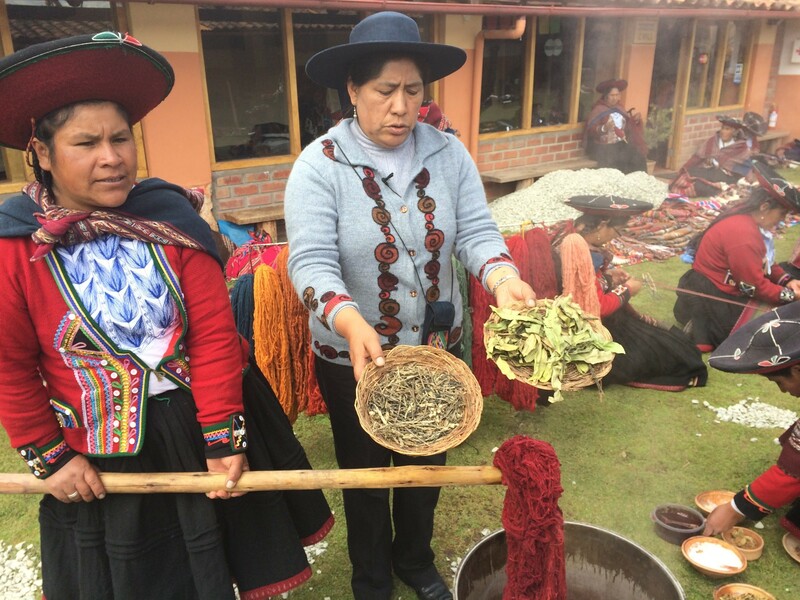 I was honored to be able to partake in such a significant part of the Quechua culture. Not only was I witnessing the past, I was able to be a part of it. 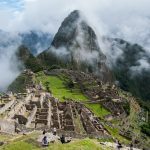 Of course, Machu Picchu is the highlight of Peru and a MAJOR reason why travelers visit this spectacular country. 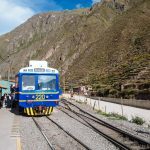 And after experiencing it at dawn, getting lost among the well-constructed village streets and breathing in the high Andean air of this unbelievably well preserved town, I could definitely see what all the fuss is about. 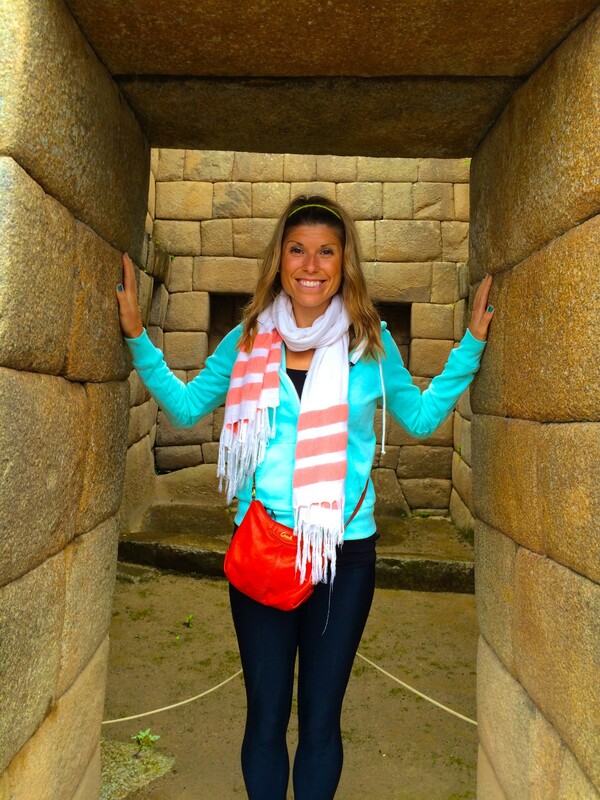 Machu Picchu is very close to exactly what it was, when it was a thriving town 500 years ago. 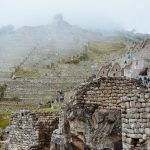 To see it in person, you half expect villagers to walk out of their homes, Incan farmers to be harvesting the terraced fields or maybe to witness the Incan leader addressing his village from one of the highest altars. It’s not just breathtaking views and Instagram fodder, Machu Picchu is still very real. Being here reminded me that the Inca were real, living people that had real joys and struggles in their lives, like you and I.
Peru taught me that the history may have happened hundreds of years ago but it can still be present today. And understanding what Peru is today is crucial in fully grasping the destination’s past. Not only seeing it, but experiencing that the past is what will carry it into the future. Machu Picchu is even better in person.